6th Renault Megane concept | What Car? One of the better-kept secrets of the Geneva motor show was the Renault Megane Coupe concept car, which insiders say bears a strong resemblance to the upcoming production model of the car, even if many of its more eye-catching facets are unlikely to go onto any garage forecourts. Most strikingly, the car features roof-mounted doors that open to allow both front- and rear-seat access, although there is no chance of this system making it into production. In addition, in a neat collaboration that is unlikely to ever see the light of day, the car is unlocked and locked using a Samsung mobile phone which serves as a hands-free card and locks into the cars centre console. The four-seater features separate climate control switches for each passenger, while everyone inside benefits from the natural light that is let in by the panoramic roof that extends from the windscreen. Again these touches are likely to remain concepts. 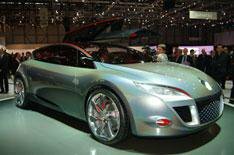 The concept car is powered by a 197bhp 2.0-litre diesel engine that is linked to a six-speed gearbox. This gives a 0-62mpg time of 7.2s, yet CO2 emissions are kept to 154g/km, underlining Renaults increasing push towards green models. Why it's a highlight: Outlandish styling in the best tradition of concept cars; outlandish features in the best tradition of concept cars; almost certainly looks better than the real thing will.